Eat Your City: Lucky Season Hotpot Restaurant, Richmond Hill, ON - tasty multi course Chinese dinner with lots of lobster! Was in Toronto for the Easter long weekend to visit family and to shop for wedding related stuff, so in-between the frantic pace of dress fittings and power-shopping (ladies, you know what that is.. its shopping with a mission which means hitting up several malls a day), we interspersed it with tasty food with the familia! On one of the nights were were in town, we had a lovely dinner at Lucky Season Hotpot Restaurant. It was previously Lucky Season Cuisine, but is under new management (and slight change of name) with pretty good food and service. On to the feast… and lobsters! My uncle ordered a swhackload of food and added in an optional 3 type of lobster feast on top. Adding in extra lobster is always good thing on the menu in my books. We started off with an appetizer of Peking duck wraps. The BBQ Peking Duck had nice crispy skin and we made these little rice flour based wrappers, duck, hoisin sauce, leeks and cucumber wraps disappear within 2 spins of the lazy susan. The next dish was one of the few vegetables we got - Chicken with stir fried veges. It wasn't super memorable, but the chicken was tender and savoury. Next up was a duo of lobster in ginger and green onions. The lobsters were a good size and cooked to a succulent savoury nom nom with gentle notes of ginger and green onions. (lobster dish 1 - it gets better...). The next lobster dish (lobster #2) tied with lobster dish #3 as the best of the night - lobster with yee-mein noodles was my fav of the night. 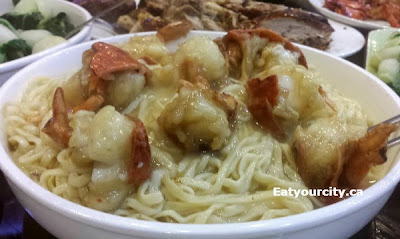 Generous large chunks of lobster tail is sauteed to perfection and served with a lobster based sauce on fluffy tender yee main noodles. Nom!! 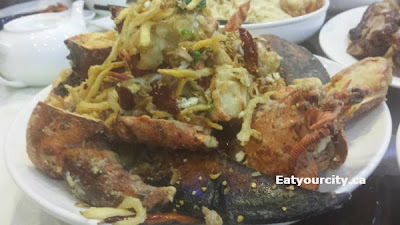 Lobster dish #3 was the fav of many around the table: Extra large deep fried lobster. Now lobster is already pretty awesome. Deep fried anything is also awesome. Combine the 2 with an epically huge lobster for a succulent deep fired lobster = winner! Lucky Season ups the ante by adding in more savoury elements with some lightly battered deep fried tinny fishes which I initially thought was onions straws. Our second vege dish of the night is Braised tofu and mushrooms hotpot - Loaded up with lots of fried tofu, straw, button and Chinese black mushrooms in a savoury gravy, it quickly disappeared. The Special fried rice (though you can't see it well) had lots of unami flavours, scrambled egg, garlic and green onions. I think it had some type of seafood like scallops in it too but I forget. Simple and tasty. The last vege dish of the night was an interesting Steamed eggplant topped with pork and Chinese mushroom. 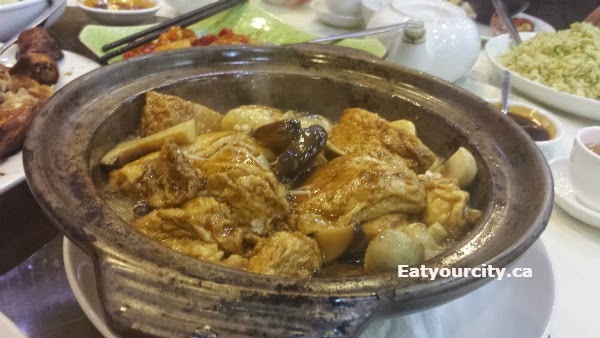 The eggplant acted as a soft tender base while the diced pork ad Chinese mushroom hadded in a nice punch of salty savouriness to the dish. Overall a good showing of food and service after rate management change. 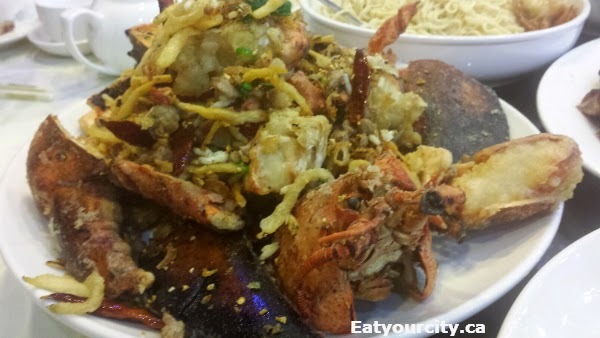 Defientely will be back for the lobster in yee-mien noodles. Nom!